Roman bust of a Maenad, pictured above, a female follower of the god Bacchus with a stunning plaited vine and ivy wreath head-dress. Salisbury Museum is delighted to announce a new temporary exhibition in the Wessex Gallery of Archaeology. From 18th November to the end of February, a special case will display some exceptional objects discovered by members of the public in the Salisbury area. A husband and wife team, detecting in the Deverill valley near Warminster, have discovered many of the treasured pieces. The state-of-the-art Wessex Gallery opened in summer 2014 following renovations costing £2.4 million, including a grant of almost £1.8 million from the Heritage Lottery Fund. A resource of international importance, the Wessex Gallery tells the story of the area from prehistoric times to the Norman Conquest, and shows why Salisbury has a unique place in the nation’s history. Metal-detectorists found these pieces over a period of almost 30 years in the Deverill valley, and have been working closely with the Portable Antiquities Scheme for 11 years. The objects they have found so far span 2,000 years of Wessex history, stretching right back into the Iron Age. The Scheme was set up by the UK government in 1997 to encourage the voluntary recording of archaeological objects found by members of the public in England and Wales. 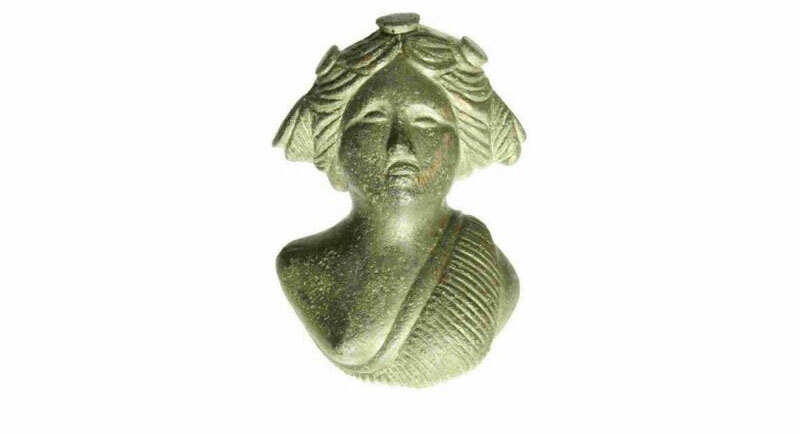 Star pieces include a superbly modeled cast Roman bust of a Maenad (a female follower of the god Bacchus with a stunning plaited vine and ivy wreath head-dress). 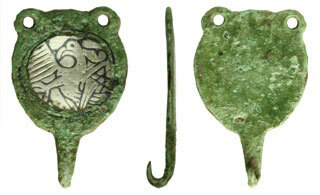 Another beautiful piece is an early medieval hooked tag showing an eagle stretching it’s wings and talons, possibly a symbol for John the Baptist, made from copper alloy with silver plate inlaid with niello. There is also a glorious gilded early medieval cloisonné brooch with a trifoliate leaf motif. “The lenders for this case have been working closely with the Portable Antiquities Scheme and the museum for a long time. We are really happy to have the chance to display their finds.” Said Richard Henry, Finds Liaison Officer for Wiltshire. The exhibition will also include four finds from across south Wiltshire that have been recorded by the Portable Antiquities Scheme and donated to the museum. Among these a pointed oval seal matrix from the sub deanery of Salisbury, made from copper-alloy between 1300-1400 AD, was donated by an individual who found it whilst gardening in Laverstock. 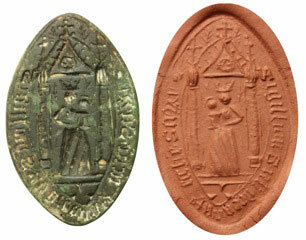 The seal depicts the Virgin and Child standing before an elaborate altar. There is also a ‘Ewart Park Phase’ sword, which is particularly interesting as the hilt was broken during the late Bronze Age. “Roughly 10 centimeters of the blade was hammered flat to create a makeshift hilt so that the sword could continue being used,” said Richard Henry. A fragment of a Bronze Age spear and a late Roman bowl are the last two donated pieces. Salisbury Museum is situated a few meters from the 13th century Cathedral in the historic town of Salisbury, where the 800 year-old Magna Carta will be redisplayed in 2015. Salisbury is also less than 20 minutes by car from the ancient monument of Stonehenge, and was recently named seventh in Lonely Planet’s 10 best cities to visit in the world.